Double click the installation package, and then an installation dialog will be popped up. Click the "Install Package" button to install. After installing the package, restart your computer. 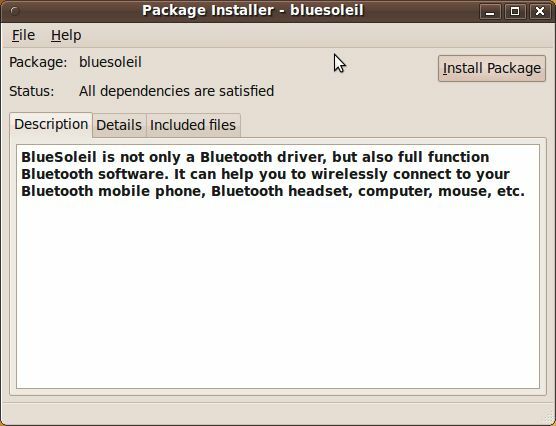 Note:If you already have a previous version of BlueSoleil installed, you need to follow "Removal BlueSoleil" to uninstall BlueSoleil before you install the new package. Open a console terminal from entry "Applications->Accessories-> Terminal". You can start BlueSoleil from entry "Applications->Accessories->BlueSoleil". 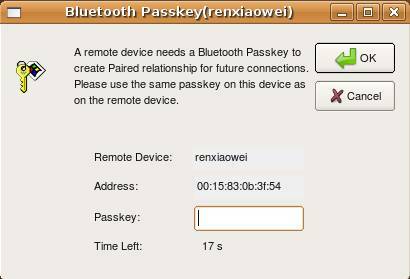 Make your Bluetooth devices discoverable. (Reference to your Bluetooth devices'manual). Double-click "Central Sun" icon in BlueSoleil window. Then your Bluetooth devices will be found and listed on the orbit in BlueSoleil window. Double-click your Bluetooth device icon to search services. 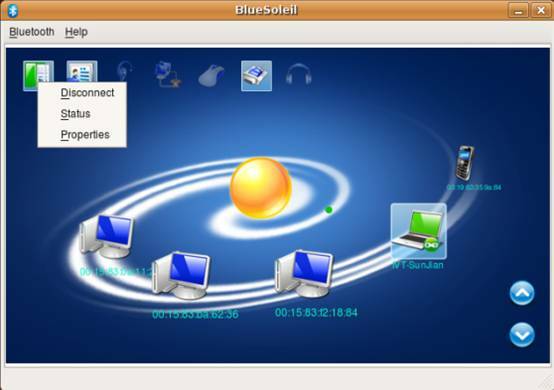 Available services will be highlighted by service icons located on top of the BlueSoleil window. Double click a service icon to initiate a connection. You might be prompted to enter a passkey to authenticate. Enter the same passkey on both sides, or enter the specific one provided by the device manufacture on your computer side only. A dialog box as shown benlow will pop up for you to enter a passkey. After the connection is established, both the Bluetooth device icon and the service icon will turn green. Right-click the connecting service icon, and select Disconnect.